Women are to be offered the chance to carry out smear tests at home in a bid to cut the rates of cervical cancer. The pilot scheme will see some women in north and east London given self-sampling kits from September. It comes as take-up of cervical screening in England hits a 20-year low, with concerns that embarrassment could make some people miss tests. The home testing could be a "game-changer", said charity Jo's Cervical Cancer Trust. The kits test for human papillomavirus, the virus that causes 99% of cervical cancer cases. The organisers hope to offer self-sampling kits to more than 22,000 women. Recent worries about the low rate of women having the test led to the first cervical screening advert to be launched in England earlier this month. The NHS wants 80% of women between the ages of 25 and 49 to be tested every three years. It wants the same proportion of women aged 50 to 64 to be screened every five years. London has been chosen for the home testing project because figures show it consistently has the lowest average screening coverage in England - 64.7% against 71.4% nationally in 2018. In some areas of England, less than half of eligible women are having the test. Robert Music, chief executive of Jo's Trust, said he was "delighted" at the pilot scheme. He said: "We have been calling for this for a long time and believe this could be a game-changer in regards to access to screening. "Introduction of self sampling will be of enormous benefit to many people, including survivors of sexual violence and women with a physical disability. "Other countries are already seeing very positive results of HPV self-sampling, with those who have delayed attending for many years choosing to take the test. "It is now crucial that this pilot moves forward quickly to ensure we are not left behind in our vision of eliminating cervical cancer." Women aged 25-64 who are eligible for screening but are at least six months overdue for the test will be invited to take part in the pilot at participating GP surgeries. King's College London is working on the pilot with University College London Hospitals Cancer Collaborative, which has been commissioned by the NHS to improve cancer outcomes. It aims to assess the feasibility of providing the option of home testing to women across England who have not responded to invitations for screening. Some women trialling home-testing in other countries have compared it to using a tampon. The kits will contain a vaginal swab, similar to a long cotton bud, and it will take a few minutes to collect a sample. A freepost envelope or box will be provided for women to send their sample to the lab for testing. 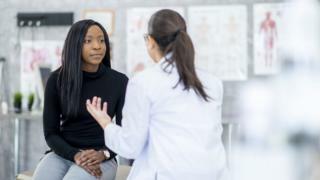 Doctors say women may not attend cervical screening for a number of reasons, which can be related to the procedure itself, such as embarrassment, fear or a previous bad experience. Busy lifestyles can also get in the way for some women, or they have difficulty getting appointments. Professor Sir Mike Richards, the government's former cancer director for England, told the Public Accounts Committee the pilot had "great promise". He said: "If we find it is successful, it might well be able to reach people who aren't being reached by the current service. "We need to improve the convenience for patients - better access in terms of out-of-hours services, better access in terms of [clinics] close to where people work - but on top of that we may get to a different segment of the population by offering HPV self-sampling sets through the post. "That's what we are beginning to see in other countries." NHS chiefs announced earlier this week that they were taking the cervical screening system back into their own control, as it has been run by Capita in recent years. There has been dissatisfaction at how it had been performing. News of the pilot comes on the eve of the 10th anniversary of the death of reality TV star Jade Goody, who died at the age of 27 after being diagnosed with cervical cancer. There is already a home-testing scheme for bowel cancer. Correction 21 March 2019: This story was updated to make clear that the pilot scheme will run in London only, and not London and north-east England. Is it time for 'smear test' to be rebranded? Video Why are BAME girls less likely to get the HPV jab?